I picked up these books off the rack at the local IGA supermarket back in 1984 when they were originally printed. 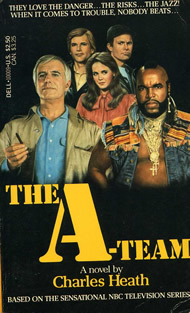 For the record, the first book cover is not scanned poorly. It was actually printed that crooked. At $2.50 each, I'm sure my velcro wallet took a hit at the time but I didn't care. 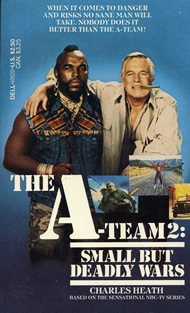 All I wanted was anything and everything A-Team that I could get my hands on. I can honestly say that these books have never been read. Just a few months ago I started reading the first book but quickly realized that these books are exact representations of the first few episodes -- almost like reading the scripts themselves. 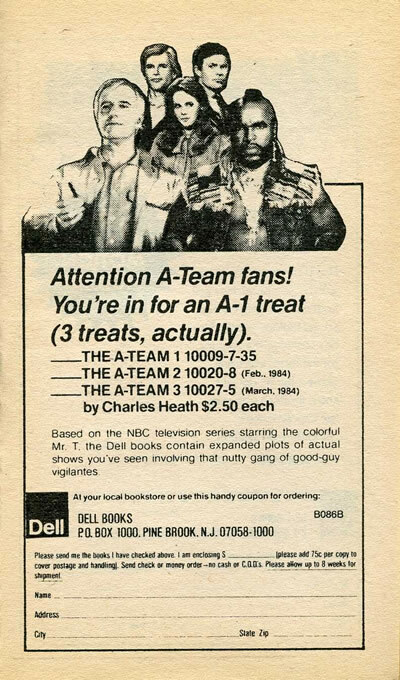 One of the final pages in each book offers fans an "A-1 treat". Actually, it just offers fans the chance to buy the other two books through the mail instead of conveniently purchasing them off the same rack as the one they have in their hand. Starring the "colorful Mr. T?" Interesting choice of words, Dell Books. 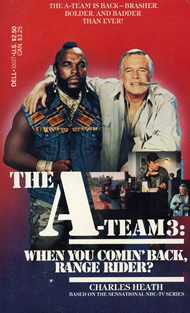 I'm surprised it doesn't go on to mention the "pasty white George Peppard." Apparently there were three other books in this series but I've never bothered to buy them. If you're curious, the titles above and the others can be found on Amazon and eBay (although most of the prices on eBay are quite ridiculous).